City manager Wally Bobkiewicz speaks at a meeting. 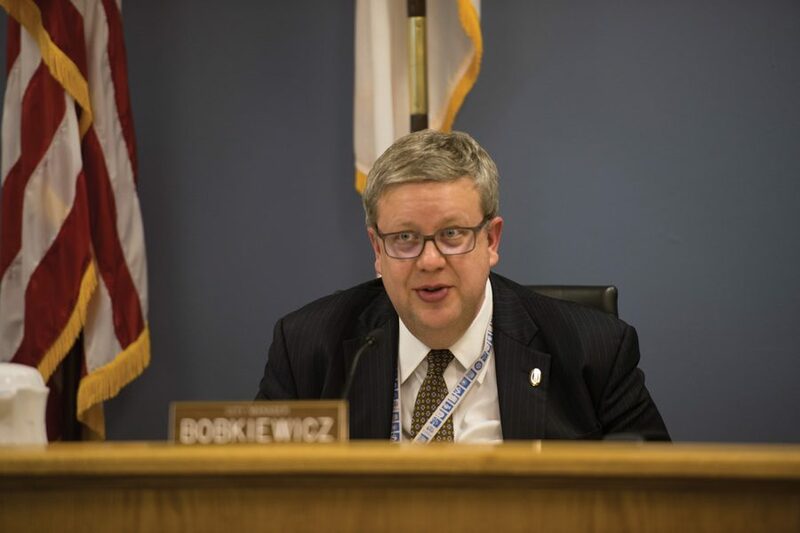 Bobkiewicz on Saturday urged aldermen to vote not to eliminate the communicable disease surveillance specialist in the proposed 2019 budget. City manager Wally Bobkiewicz on Saturday urged aldermen to vote not to eliminate the communicable disease surveillance specialist in the proposed 2019 budget. The decision would go against the current draft of the city’s budget proposal and would allow Evanston’s Department of Health and Human Services to keep its certification and continue to receive federal and state funding. The budget proposal recommends the elimination of seven positions in the department to help fill the city’s projected $7.4 million deficit. However, Illinois state law requires one of the positions, the communicable disease surveillance specialist, to be filled for the department to be recognized and receive federal and state funding. The specialist collaborates with medical providers and residents to investigate reports of infectious diseases and alert the city’s health department. They also partner with healthcare and public health agencies to control infectious disease outbreaks. Don Zeigler, chair of the Evanston Health Advisory Council, expressed his concern with the suggested cuts and restructuring during an Oct. 23 City Council meeting. Bobkiewicz said during the meeting that the city never intended to lose accreditation for its health department, which promotes access to healthcare, food, shelter and other services. Cutting the one position decreased the city’s deficit by $112,706. Ald. Peter Braithwaite (2nd) and Ald. Eleanor Revelle (7th) told The Daily that they wanted to restore the position to the budget to keep the health department. They also expressed interest in keeping Evanston Fire Department’s Fire Station 4 open. The proposed closure of Evanston Fire Department Station 4, which would save the city almost $1.3 million, has met backlash from residents living in 2nd Ward and the department’s firefighters. Over 30 residents against the closure attended the meeting’s public hearing, and Billy Lynch, president of Evanston Firefighters Local 742 union, spoke of the fire department’s role in the ward. Braithwaite and Revelle expressed uncertainty about other funding sources that would step in to keep the budget balanced. Ald. Ann Rainey (8th) and Braithwaite raised the idea of increasing property taxes to help balance the budget. “I’ve gotten the sense that residents wouldn’t mind paying a little more on their tax bills if they knew the money was going to safety services,” Braithwaite told The Daily after the meeting. Revelle said the city could slow down its build-up of general fund reserves, as the city is currently trying to reach a reserve level of 16 percent over three years. If the city took six years, Revelle said, it could save $750,000. Aldermen will further discuss the budget at their next meeting on Oct. 29.